Anyone can do CrossFit, and that includes you. Regardless of how long it has been since your last workout, we make getting started easy. If you know you are ready to sign up for our CrossFit 101 Course, download this waiver and this health questionnaire and drop them off at the gym anytime along with your payment to reserve your spot! If you are visiting from another affiliate and want to drop in for a class, download this waiver and drop in! Our drop in rate for in town athletes is $15 per class. If you are from out of town and will be here for an extended period of time, the rate is $15 for the first class and $10 for each additional class. We can also prorate memberships for out of town athletes who are here for two weeks or longer. Email us at crossfithuntsville@gmail.com if you have any questions or if you want to let us know what class you will be attending! Our CrossFit 101 course completely prepares beginners for our CrossFit group classes. Our 101 classes occur every month, and meet three times per week for two weeks. The course is designed to set you up for success, teaching new CrossFitters the basic movements, skills, and nutritional knowledge they will need for our group classes, while giving our staff the opportunity to gradually introduce you to the program. Once you have finished your individual training, regardless of how you got here, you will be welcomed into our group classes. These classes run every day of the week, and are designed to get you the good stuff- lose weight, gain strength and endurance, agility and balance, coordination and accuracy, all while having a good time and becoming a member of our community. – Before you start our group classes, you must complete our two-week CrossFit 101 course. We are currently running a special, and our CF101 Course is only $100! It is required that all new athletes complete all 6 sessions of our CF101 course. If you are unable to make a session, you can meet one-on-one with a trainer and make up the session for $30. -If the days and times of our 101 course don’t work with your schedule, sign up for a personal 101. During a personal 101, you will be paired with a trainer that can meet with you on days and times that best fit your schedule. The personal 101 usually takes 2-4 sessions. We are currently running a special, and our personal CF101 course is only $200! Email us today to get started right away! -If you have a group of people interested in a personal 101, email us for possible reduced rates! This membership allows athletes to attend regular CrossFit classes up to 3 times per week. Classes expire at the end of each week. Unlimited childcare can be added for $25/month. Additional classes including workshops may be attended for $15/class. This membership allows athletes to attend on average 4 classes per week; however, classes do not expire at the end of each week, so unused sessions roll over within any given month. Silver members can attend all CrossFit classes as well as specialty classes such as Running & Endurance, Yoga, and workshops. This membership also includes FREE monthly childcare for up to 2 children, currently provided Monday – Friday 8:00am-11:30am, Monday – Thursday 3:00pm-7:30pm, and Saturday 8:30am-11:30am. Additional children may be added for $10/month. Gold Membership: $200/month UNLIMITED CLASSES! This membership allows athletes to attend unlimited classes at CFHSV, including all specialty classes such as Barbell Club, Yoga, Workshops, Running & Endurance and Open Gym. Gold members also receive FREE monthly childcare, currently provided Monday – Friday 8:00am-11:30am, Monday – Thursday 3:00pm-7:30pm, and Saturday 8:30am-11:30am. Gold Members also have access to Open Gym held Monday – Friday 10:15AM-11:30AM and 12:30PM-3PM, Saturday 11AM-12:30PM, and Sundays 130PM-3PM, as well as Platform Open Gym held Monday – Friday 8:15AM-10:15AM and 3PM-7PM. Gold members also receive FREE monthly locker rental as well as 10% off all CFHSV apparel. 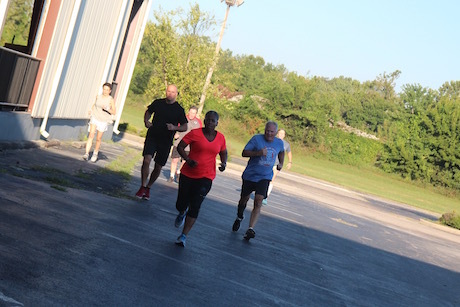 Because CrossFit Huntsville is a hybrid between personal training and group fitness, our prices are substantially higher than a regular, or “Globo-gym” and substantially lower than traditional Personal training. We aren’t ashamed of our prices because we know how much better our product is than that of a traditional gym membership. You are the only one that can decide if joining CrossFit Huntsville is for you, but let me add this- Even at our highest level of membership, we are far cheaper than paying for a globo-gym contract, then hiring a personal trainer, buying nutrition books, and then paying for group classes. And the punch line is this: we actually get you results. Remember- Anyone can do it, but not everyone is committed and ready to change their lives.